Recruit Training: Are we preparing officers for a community oriented department? As many law enforcement agencies embrace the community policing philosophy and continue to strive to achieve the goal of full implementation, they may want to examine how their academies are preparing their new recruits. Are they developing collaborative problem solvers? Or, are they creating obstacles to their community policing efforts? Are they creating barriers to bringing their customers, the citizens they serve, improved quality of life by addressing crime and public order problems through partnerships with community stakeholders? Some recruit training programs may actually be creating impediments to success. According to the U.S. Department of Justice, Bureau of Justice Statistics, Report on State and Local Law Enforcement Training Academies (BJS Report), the majority of police recruits receive their training in academies with a stress-based military orientation. 2 This begs the question; is this military model—designed to prepare young recruits for combat—the appropriate mechanism for teaching our police trainees how to garner community trust and partner with citizens to solve crime and public order problems? Some believe that certain benefits may be derived from the militaristic stress environment, e.g., self-discipline, self-confidence, and command presence to name a few. However, the warrior-like orientation seems antithetical to a community oriented policing philosophy that is grounded in trust building, partnering, and developing and sustaining positive relationships with citizen stakeholders that are integral parts of community oriented policing. Questions surrounding the efficacy of stress training for police recruits are not new. From 1967 through 1971, Assistant Sheriff Howard H. Earle conducted an experiment on stress vs. non-stress training in the Los Angeles County Sheriff’s Department Academy. Though dated, his findings could be relevant to the development of today’s police officers—officers who are expected to work collaboratively with citizens in their communities to identify and solve crime and public order problems. Earle found that “non-stress trained subjects performed at a significantly higher level in the areas of field performance, job satisfaction, and performance acceptability by persons served.”3 Higher levels of performance in all of these areas are attributes that can lead to improved relationship building and collaborative problem solving with community stakeholders. As recruits embrace the paramilitary trappings of a stress academy and become more socialized into the police profession, they tend to identify more and more with their peers and separate themselves from “outsiders.” This may become a barrier to effective partnership building required in collaborative problem solving. It has also been said that “paramilitary stress academies” that apply pressure to recruits to produce a response to said pressure “socialize recruits into maladaptive coping strategies.”10 Maladaptive coping strategies can also act to further distance officers from citizen stakeholders. All of this should come as no surprise as the stress training is built on the military model and the military mission is generally to work within a close knit team to achieve an objective through the use of force and violence. This is contrary to the role of a police officer in the context of a community oriented department, which is to develop relationships with citizens that lead to collaboration in identifying, addressing, and solving crime and public order problems as their primary objective. Departments that are struggling with full implementation of their community policing plans, or having trouble in the development of problem solving partnerships in some neighborhoods, may want to take a look at their recruit training. 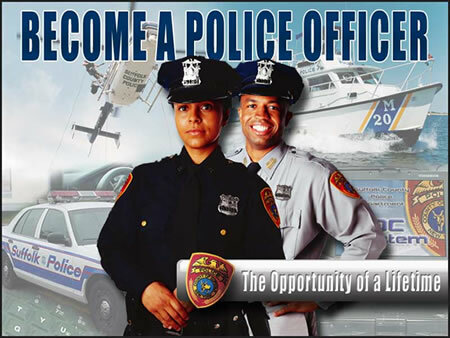 Are those who are coming out of their training academies truly ready and equipped to handle the challenges of community policing, or are they potential barriers? 1Reaves, Brian A. 2009. 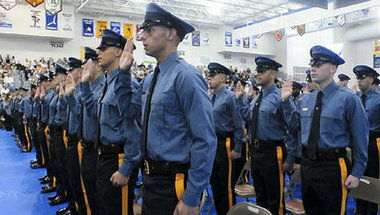 State and Local Law Enforcement Academies, 2006. Washington, D.C.: Bureau of Justice Statistics Special Report, U.S. Department of Justice, p. 10. 3Earle, Howard H. 1973. Police Recruit Training Stress vs. Non-Stress: A Revolution in Law Enforcement Career Programs. Springfield, Illinois: Charles C. Thomas, p. 145. 4Massachusetts Governor’s Board. 1989. Report of the Governor’s Panel to Review Police Training Programs. The Commonwealth of Massachusetts, p.72. 6Conti, Norman. 2009. A Visigoth System: Shame, Honor, and Police Socialization. Journal of Contemporary Ethnography (May). http://jce.sagepub.com/content/early/2009/03/17/0891241608330092. 7Conti, Norman. 2010. Weak Links and Warrior Hearts: A framework for judging self and others in police training. Working Paper 24, International Police Executive Symposium, Geneva Centre for the Democratic Control of Armed Forces. 8Sgambelluri, Robert. 2000. Police Culture, Police Training, and Police Administration: Their Impact on Violence in Police Families. In Domestic Violence by Police Officers, ed. D.C. Sheehan, 309–322. Washington, D.C.: U.S. Government Printing Office. 9Chappell, Allison T., Lonn Lanza-Kaduce. 2009. Police Academy Socialization: Understanding the Lessons Learned in a Paramilitary-Bureaucratic Organization. Journal of Contemporary Ethnography (December 29): 22. 10Conti, Norman. 2009. A Visigoth System: Shame, Honor, and Police Socialization. Journal of Contemporary Ethnography. Sage Publications (May). http://jce.sagepub.com/content/early/2009/03/17/0891241608330092. 11Chappell, Allison T., Lonn Lanza-Kaduce. 2009. Police Academy Socialization: Understanding the Lessons Learned in a Paramilitary-Bureaucratic Organization. Journal of Contemporary Ethnography (December 29): 21. 12Reaves, Brian A. 2009. 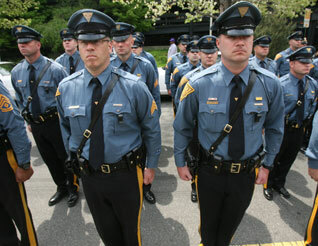 State and Local Law Enforcement Academies, 2006. Washington, D.C.: Bureau of Justice Statistics Special Report, U.S. Department of Justice, p. 11.